Our mission since day one of opening our doors has been to provide the very best in quality home companion services allowing you or your loved one to maintain independence and experience the highest quality of life possible by staying in your own home. Fulfilling this mission is of extreme importance to us. That’s because our management team (Meet The Team) learned first-hand what home care companionship can mean for a loved one who needs it; yet unfortunately, in this case, she did not experience this type of caregiving to the fullest – care that during this period in her life could have enriched her day to day living in so many ways. 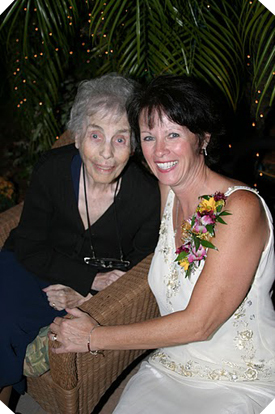 Read on and learn the story behind TLC Companion Care, someone we truly loved and work to honor in serving those homebound due to physical and mental challenges everyday. The year was 2001, when we, Wayne and Debi Gregson, (you can read more about us on the Meet The Team ), made a major decision. Out of the love we shared for Wayne’s aging mom, Marion, we moved to Florida to be closer to her in the final years of her life. This occurred shortly after Wayne’s dad had passed away, leaving Marion on her own. This decision proved to be an eye-opener for us. We quickly learned Marion’s life was nothing like we thought. It soon became clear, for example, that she wasn’t going out with friends as she always had done. Nor was she eating nutritiously or taking proper care of her home. Hence, we developed a ritual, visiting her as often as we could to clean up the house, shop for her, take her to lunch and to see friends. It wasn’t long before Marion started to develop signs of dementia. She started smoking, putting the ashtray under the sofa to hide her habit. The house became messier between visits, as she now left newspapers and dirty dishes all over the floor. Friends of hers told us she would forget where she left her car or her glasses. It was now no surprise to find another new dent on her car whenever we would visit. Equally distressing was finding unpaid bills and overdue notices on the kitchen table. Wanting her independence, we respected her wishes and so this went on for sometime, until one day when she was visiting our home and had to be taken to the hospital. Because of her deteriorating condition, the doctor bluntly told her she had to either move in with family or to an assisted living facility. She could no longer live alone. She chose to live with us. The year that followed was a time of much happiness. Despite some occasional tantrums from Marion, we enjoyed her company and vice versa. She loved walking with us around the mall, going out to lunch and family parties, shopping, and even excursions to the beach and on our boat. It’s no wonder she gained weight and demonstrated a sense of contentment. But the second year was another story. Wanting greater independence, we respected her wishes allowing her to move to an assisted living facility that suited her. Her dementia got worse, but they were able to tailor the program to her needs. Thus, we were still able to continue to do all the things with her as previously, but this new living arrangement didn’t last long. When her best friend left the facility, Marion’s health quickly declined. She gave up on life and died shortly thereafter. How much longer could she have stayed in her own home with friends close by in familiar surroundings? Would Marion have been happier and had a better quality of life in her remaining years if she had a loving, caring friend to help her with her daily routine? To what degree would her health both physically and mentally have been enhanced if she always had someone to eat lunch with, make Christmas cookies, discuss current events and keep her up to date on paying her bills? We now know the answers. There is little doubt that a home companion caregiver would have made a world of difference in Marion’s life. At the same time, it would have eased the strain put on the family to care for her and meet her needs. Our time with her would have been better-spent playing cards, doing jigsaw puzzles, relaxing and listening to her recall fond memories in her life. various talents and experiences and know we would be making a difference in the lives of others. A business that allows us to keep our customers active, happy and independent, living in their own home as long as possible; and allows us to honor dear Marion everyday.